This year, the world's first global election is taking place, an election between earth and global warming. It's not about what country you are from, but what planet you are from. Your light switch is your vote. We need one billion votes for earth, because our planet is worth saving. 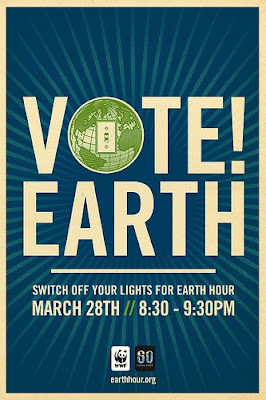 Vote Earth by simply switching off your lights for one hour and join the world for Earth Hour. Saturday march 28th, 8:30-9:30pm. You can learn more about Earth Hour at www.EarthHour.org, and you can sign up to participate at www.EarthHour.org/signup. If you’d like a high level history of Earth Hour, more than 50 million people in 400 cities around the world took part in Earth Hour 2008. The lights went out at Sydney’s Opera House, Rome’s Coliseum, the Empire State Building and the Golden Gate Bridge. Even the Google homepage went dark for the day. Many major corporations took part including HP, Coca-Cola, and Morgan Stanley. Energy efficiency isn’t just good for the bottom line. We all have a stake in the future of our planet and must learn to operate in ways that don’t deplete our world’s limited natural resources. By simply turning off all non-essential lighting for one hour at our company buildings and in our own homes, we will join tens of millions of concerned citizens throughout the world in calling for action to save our planet for future generations. I’m excited about Earth Hour and I hope you’ll join me in uniting with the world to make a difference for our planet. Don’t forget—March 28th at 8:30 pm, turn out, take action.